For storage configurations, open the Storages page (navigate to Storages button on your ribbon). The storages configured on this page can be selected as a destination for the processed binaries when configuring a certain contentACCESS job. contentACCESS supports Disk storage (most frequently used type), H&S Hybrid Store, Perceptive, Datengut storage etc. The table of storages is initially empty. To configure a new storage, click on + new on the Storages page. The Storage repository window will open. Type in the Store name and select a Store type from the list. The required storage settings depend on the storage type that you have selected. This store type is used if the user would like to store the binaries on a single local or remote disk. This is the most frequently used store type from the types listed above. After this store type has been selected, fill in the Path (the target destination for the binaries) and enter credentials if required. Choose whether you would like to have extra recovery functionality with checking/unchecking Store metadata in DB. When checked, contentACCESS saves the extended metadata into the storage database. This function can spare even more space in the database. The user also has the possibility to decide if he wants to use the Compression function. With checking this checkbox, all files larger than 4 kilobytes will be compressed, except of already compressed file formats such as JPG, MP3 etc. This feature may slow down the store functionality, but on the other hand it will spare storage space. Under Database settings select a Database connection. 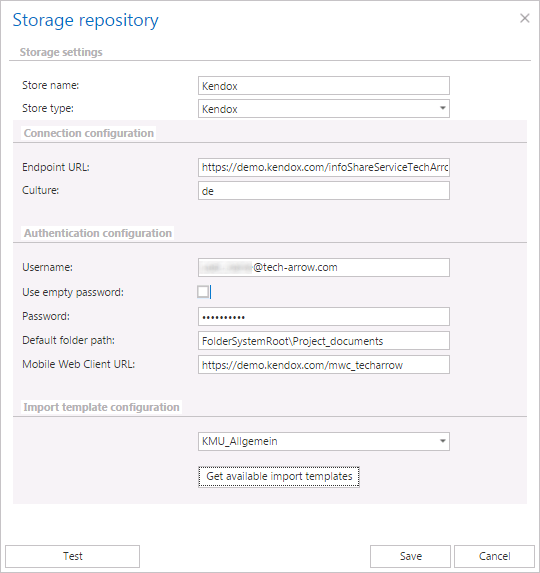 This configuration will play an important role when using the Storage replication plugin. It is also possible to run a test control via Storage replication plugin. We recommend NOT to change the already configured database that the disk storage uses (however, it can be changed using the “Change” button if it is needed). We also advise to verify the connection using the Test button. The test is checking if the right credentials have been specified, and if the connection with the database has been established. ✓ Volumes approaching or larger than 64 TB in size. What to consider before a previously configured disk storage is changed? These settings will ensure, that the archive and restore jobs will automatically use this new storage path. The administrator will not be required to change the storage settings on the jobs’ configuration page, too. The new value will be automatically used by the jobs, where the “old” storage was already configured. Use secure connection: Check this option to allow a secure connection with the Hybrid Store. The communication will be secured by a Windows authentication (the contentACCESS service user will be used). If the tenants are not loaded, then the user needs to enter the HybridStore tenant ID (GUID) manually. Scheme: Click on “Load” to load the available Hybrid Store schemes and select the one that should be applied. If Hybrid Store uses secure connection and the option is not checked in the dialog, the schemes will not be loaded. Database settings: Select here an already created database that contentACCESS will use to store the necessary data. It is NOT recommended to change the already configured database that the Hybrid store uses. However, it can be changed using the “Change” button if it is really necessary. It is recommended to verify the database connection using the “Test” button at the bottom of the dialog. This storage type is currently used when synchronizing emails in multiple mailboxes. For more information please refer to Email synchronizer plugin. Plugin configuration: The email synchronizer job(s) that are already created in Custom plugins ⇒ General ⇒ Jobs will be listed in the dropdown list. Select from the dropdown list the Email synchronizer job that will collect the metadata of the archived emails in a queue. This job is used to synchronize the email message categories in multiple mailboxes based on the metadata that are saved into its queue. Note: For more information refer to chapter Email synchronizer plugin. Culture: The names of folders, properties will be shown in the language specified here. The language can be a country-code (e.g. de) or both the language and country-code (e.g. de-CH). Username and password: Specify the Username and Password that can be applied to connect to the storage. Use empty password: Use empty password. If this is checked in, a password empty string is saved. Otherwise – if the username was not changed – the old password is saved. Default folder path: During the archiving or publishing process the data will be saved/published from the folder, which is specified in the path. Mobile Web Client URL: This configuration option needs to be set only in case that the storage is used in a SharePoint Publishing job, and the job is configured to create custom lists with links pointing to the source documents. The URL must be the Kendox Mobile Web Client’s URL, where the published documents can be accessed. The URL is used to generate the retrieve URL of the published document. In the archiving process, import template is used to map the metadata between the source document and the newly created document in the Kendox store. Click the “Get available import templates” button to get the available import templates. This import template is only used if the target folder doesn’t have any default import template, otherwise it is ignored. From the given storage’s context menu, on the Storages page, you can modify (Edit/Delete/Set default) the storage settings by clicking on ellipsis (…). The configurations set in the Storage repository window can be viewed in the grid. Note: The “+ new” option above the item list is unavailable for the logged on user, if the “Add repository items” permission on the tenant is not allowed in his role assignment. The “manage access” option allows to grant access permissions on the selected storage for a second user. This “manage access” option is available for the logged on administrator, if his role assignment contains the Edit repository items – All allowed permission on the tenant. Read more in Managing access to contentACCESS objects. Azure Storage is a cloud storage solution. It also provides the storage foundation for Azure Virtual Machines and is accessible from anywhere in the world, from any type of application and any type of device. 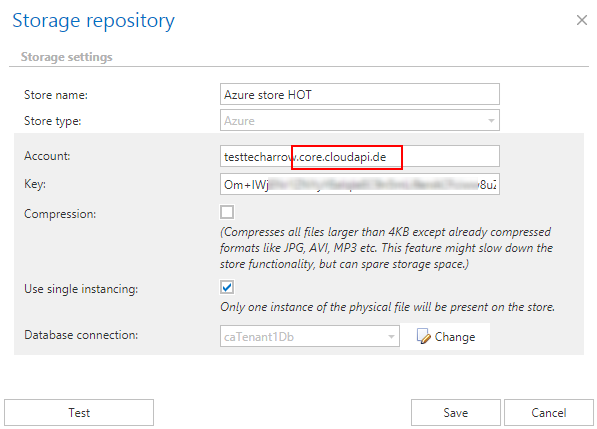 In case of the user having/using a German cloud (dedicated and isolated Microsoft Azure version for Germany), the Azure storage account name must contain the .core.cloudapi.de suffix. 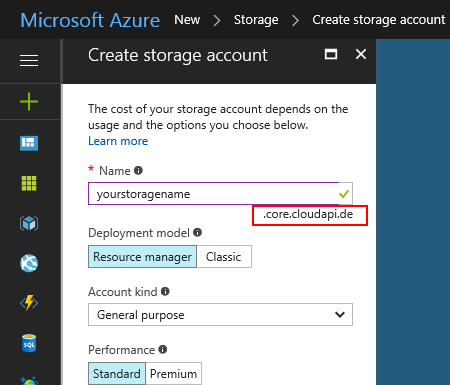 This is displayed in Azure configuration, when the user creates the storage.